We know how difficult it can be to choose a breed of dog to suit your lifestyle, perfectly. Fun loving, intelligent and beautiful are all characteristics of the West Hoghland White Terrier, otherwise known as Westie, in fact if you ask us, the Westie breed is the most attractive of the Terrier family. Originating in Scotland, the Westie was first recognized by the AKC in 1908 after its arrival in the U.S. in 1906. This breed is a well-rounded, sturdy dog that brings fun and unconditional love to its owner. On average, Westies live for about 15 years. Westie males will grow in height from 10-12 inches and 15-22 pounds in weight. The female averages between 9 and 11 inches in height and 13-16 pounds in weight. Other physical attributes include two coats of fur. The bottom coat is thick for heat insulation, whereas the top coat is much lighter and pure white. You will only find a Westie stark white in color. What really makes a Westie a joy, aside from their stunning appearance, is their adaptability to new surroundings and people. Westie’s don’t require too much space and are very good around children. Not to mention, a Westie is easy to train. Do you have other dogs and are unsure about adding another puppy to the family? Rest assured, the Westie is not known for picking fights with other breeds. Westies are playful and love companionship. If the Westie is trained to become pack leader, you might see a little aggression towards other dogs in protecting their territory. If you want a high-energy, friendly and absolutely adorable dog, choose the Westie breed. 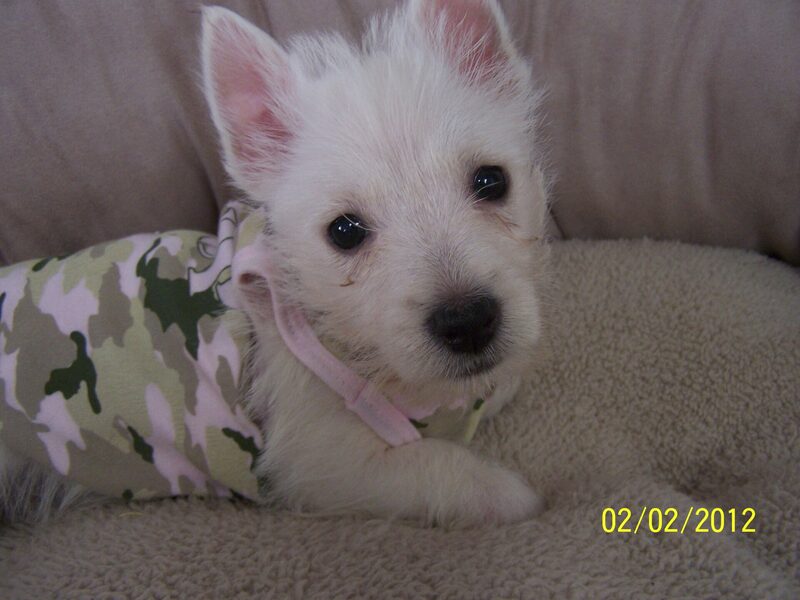 Be sure to check out Pauley’s Pups for Westies that will make the perfect companion for you and the family.